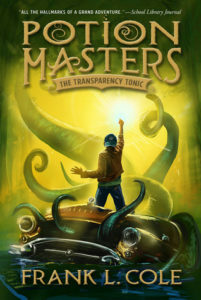 Book 2 of the Potion Masters series is a fun read for anyone who is into fantasy books. In this gripping story, we continue to follow Gordy through his journey to become an elixirist, but there is a few problems: Adilene isn’t talking to Gordy and Max and she has found a new friend, his mom has been fired from B.R.E.W (Board of Ruling Elixirists Worldwide), and his grandfather Mezzarix has a chance to escape his banishment. Also, Gordy is able to “blind batch” potions, which causes a few problems along the way. I loved this book, I thought that I had it figured out as I was reading, but the author was able to keep me guessing and I wanted to know more. An advanced readers copy was provided by the publisher to the reviewer.